When we first started getting into web design close to ten years ago, the idea of search engine optimization (SEO) was just starting to take hold. For years, web designers based their website design first on the user, with search engines often being treated as an afterthought. But over the past ten years, search engine optimization has taken a major shift. Today, we design websites specifically for BOTH search engines and the end user (i.e. YOU!). We format text, include certain keywords, add images, and layout our websites so that Google and other search giants will find the information they’re looking. This helps our websites appear at the top of Google’s search rankings and improves our search engine ranking. We often tell our clients that the Field of Dreams principle doesn’t apply to web design. If you build it doesn’t necessarily mean that people will come. There are plenty of good looking websites that have minimal traffic, all because they are not formatted for search engines. If search engines can’t find your website, nobody else is going to be able to find it either. Take a look at your own website. Type in a search term and look at where you fall on the search engine results page (SERP). Moz discovered that the first five results listed in Google account for 67.60% of all the clicks, and the results from listings six to ten account for only 3.73% of all clicks. Page two and three get only 5.59% of the clicks. On the first page alone, the first 5 results account for 67.60% of all the clicks, and results six to ten only get clicked on 3.73% of the time. If your website falls on page two and three, it receives only 5.59% of the clicks. This means that if 20 people searched for the search term you listed, only one of them would ultimately end up visiting the second page. Simply put, the chances of someone visiting your website if it falls on the second (or worse, the third!) page of Google are slim to none. Improving your search engine ranking is a marathon, not a sprint. There are a number of factors that contribute to where you fall on Google’s search results page, and you are not going to jump to the first spot overnight. This is especially true for very broad and highly competitive listings. However, there are a number of things that you can do to begin helping your ranking. We’ve outlined these in three steps below. Google wants websites to follow their formatting standards. As such, they provide consumers with many excellent tools to improve their search engine ranking. We use two of these tools on all of our websites: Google Analytics and Google Search Console (formerly Google Webmaster Tools). Google Analytics provides detailed information about your website in real time. You can see where people are visiting from, demographic data about them, and what pages they’re looking at. More importantly, Google Analytics helps you see what the search terms people typed in that actually brought them to your website. This is very helpful in determining what keywords you should add to your website’s posts and pages. Whereas Google Analytics shows how your website performs, Google Search Console shows how your website performs in Google’s search listing. Search Console helps you see what pages Google is indexing, where your website ranks on specific keywords and search terms, and what your impressions and CTR (click-through-rate) are for these terms. There are many great WordPress plugins that make installing these tools a breeze. For our websites, we install Yoast SEO, which makes setup of Google Search Console very easy. Google Analytics by MonsterInsights allows us to setup Google Analytics on our websites in less than two minutes. This is such a quick and simple task, but it provides a tremendous amount of insight into how your website is performing. Simply type in site: then enter your website’s URL (without any spaces between the site: tag and your domain). Also, be sure not to include HTTP, any backslashes, or www. Just enter your URL starting with your site name. Hit enter then take a look at the results. You’ll probably notice that your homepage appears first, followed by an assortment of other pages from your website. You’ll probably be surprised by some of the pages that are being picked up. Some pages may be appearing that you don’t want Google to index. If no pages show up, then this is a major indicator of your website’s search engine performance. If we had to guess as to what’s causing this, it would probably be one of two things. First, your website may be so new that Google’s indexing robots have not had a change to pick it up yet. If could also mean that your website’s settings are set to “no index.” This means that your website has its settings set so that Google will not keep track of your pages. This isn’t good. (For more information on how to change these settings in WordPress, visit this page). Take a look at the websites that appeared in your SEO audit. Did you see any websites that had strange descriptions underneath? Any pages that you DON’T want Google to show in search results? To fix these issues, start by making changes to your website itself. Visit the pages that appeared in the search listing and adjust their titles and meta descriptions so that they adequately describe what the page is about. Tools like Yoast SEO make this incredibly easy. Second, visit Search Console to request that Google removes certain pages from its index of your site. From the Search Console for your site, click on “Search Appearance” then “Sitelinks” in the sidebar. Then add the links you no longer want to index. Give it a few weeks for the changes to take effect in Google. With millions of website on the World Wide Web, improving your website’s search engine ranking can often seem like a difficult task. It’s difficult to see the quick changes we often want to see. But remember, search engine optimization is a marathon, not a sprint. Changes will occur over time, and often generate a large return on your investment. 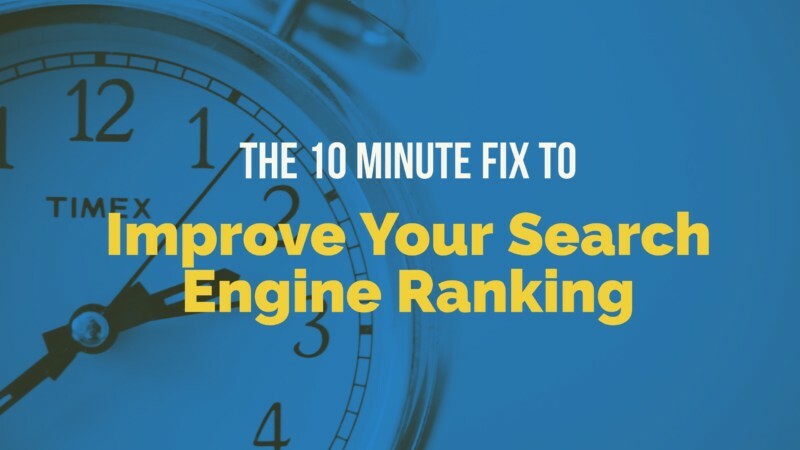 Following the tips we outlined above, you can begin to take steps that will generate an improvement in your search engine ranking in as little as ten minutes. Your website, your readers, and your ranking will thank you.